This just in: Those darn millennials won't move out of their parents' basements. Data released by the Pew Research Center this month shows young adults between 18 and 31, especially young men, are living with their parents in record numbers. 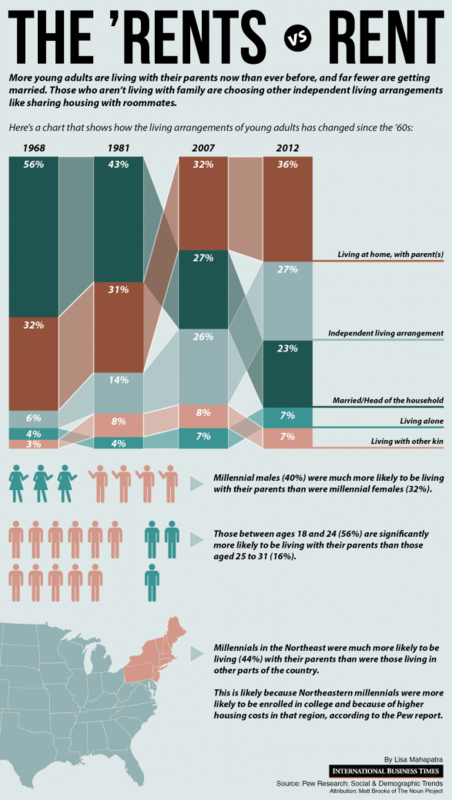 Over at the International Business Times, Lisa Mahapatra put together this infographic showing the rise of returning to the nest and how young people's living arrangements have changed over time. What's surprisingly, actually, is how little things have changed in terms of how many people live with their parents. Though 36 percent of young people living at home is the highest rate in four decades, the numbers didn't change much between 1968 and the recession that started in late 2007. What has changed is who we live with once we move out of our parents' house. Since 1968, young adults have increasingly swapped married life for independent living situations like sharing an apartment with roommates. Note that college students who live in dorms were counted as still living with their parents, which could partially explain why those in the younger range (18 to 24) were much more likely to fit into that category.